So I haven't been posting because I have several deadlines, and election fatigue, and nearly three weeks of rain. 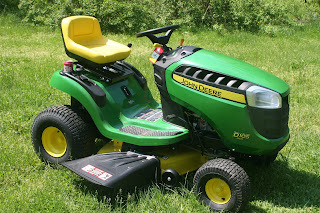 But today, I ventured out on my new mower to attack the knee deep lawns. Now, if you asked me what horrors might befall me on my lawn mower, I can imagine them. The first time I used it, I got it in a precarious position and I had to get off and find neighbors to come and, quite literally, pull it off a cliff. Then today, it was so wet that going from one area to another got it stuck in the mud -- twice. But this I did not expect. Today I punctured my eardrum while mowing. Sitting perfectly still, I have to try about three times to thread a needle. Today, traveling two miles and hour, I managed to thread a pencil-sized tree branch into my ear canal with enough force to rupture my eardrum. I did finish mowing, but then I went to the doctor who is referring me to ear, nose, and throat guy but in the meantime, he prescribed ear drops. But my cheesy insurance refused to pay for them. Frankly, I don't blame them as the ear drops were $300. 100 drops for my ear came in at $300. That is $3 a drop. Were they made from baby angel tears? Gold is less. And maybe a drop or two of gold would have fixed the hole in my ear. They gave me eye drops, instead -- for my ear. And neither the angel tears nor the eye drops offer the prospect of regaining my hearing. More later! Ouch! That must have really hurt. I just don't understand why pharmaceuticals cost so much. I'm afraid it is just greed, pure and simple. Agree with Colette. Having recently transitioned from job-related insurance to the tender mercies of Medicare, I am stunned by the cost and intractability of drug companies and providers. Thinking of a retirement job breaking into pharmacies and selling everyday pharmaceuticals on the street for a reasonable price. Oh, pardon my not saying sorry about your ear and good luck with treatment of same. Hope pain is relieved and hearing restored.